Cartridge gun dispensers are designed for the controlled application of pastes, gels, adhesives and fluids. 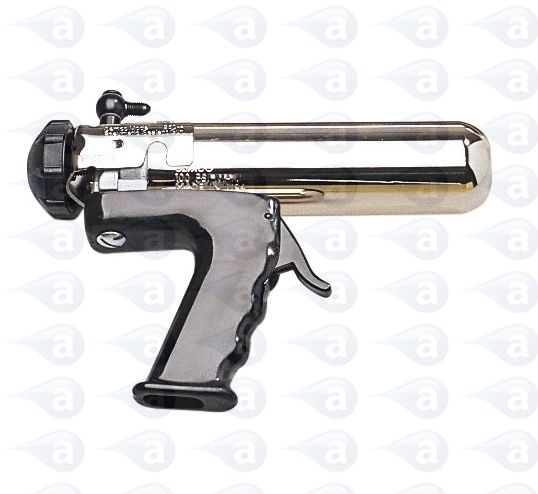 The 250A series air guns are suitable for industrial 2.5oz, 6oz, 8oz and 12oz size cartridges. These guns feature a metal solid retainer to a hand held trigger with handle. High quality applicators used in many industries for the quiet, pneumatic application of sealants, RTVs, silicones, adhesives, potting compounds, and other materials in disposable cartridges or Techkit, Semkit cartridges for multi-component materials. The guns are supplied with a choice of retainers to fit standard 2.5, 6, 8 and 12 ounce disposable cartridges. An air hose with thread connector to feed the gun can be ordered separately, if required. This range feature a built-in regulator. The gun is constructed of durable metal and engineered plastic parts designed to withstand the rigors of the production work place. The metal retainers are affixed to the valve assembly via a quick connect, secure thread lock fixture, permitting easy replacement of cartridges. All products are industrial grade and are covered by our no-quibble One Year warranty. Ultra lightweight air-powered 250A series cartridge dispense guns with bayonet metal polished retainers. Popular in aerospace applications for applying sealants to aircraft parts. With a removable handle and trigger assembly if required. Optional hose assembly inserts neatly through the gun handle. Easy to maintain and provides reliable use over a long period of time.